Charitraheen by Sarat Chandra is one of the most famous novels written by the versatile Bengali author almost a hundred years ago. However, even today, it is as thought provoking and involving as it would have appeared to the readers of that bygone era, when novelists were quite a few and even those who wrote, seldom touched upon controversial issues of infidelity and social conventions. ‘Charitraheen’ the title literally means ‘Characterless’ and in a very precise manner, sums up the entire storyline. This is a story of immorality, adultery and infidelity, more often performed in thoughts than actions of the protagonists. There is hardly a character in this saga, who could call himself or herself moral. All of them, at one point or other, digress from their accepted path of ideal relationships and step into the bottomless pit of betrayal. The story begins with the love story of Satish and Savitri. Satish, a staunch Kulin Brahmin, falls for Savitri, who though belongs to a Brahmin family, is a widow, working as a servant in the mess, and is almost untouchable for the Hero in the tight lidded Hindu Society of 1900s. As both of them are too aware of social hierarchy and diktats, they try to conceal their mutual feelings. They hide their love under the garb of humble care and servitude, thus deluding themselves and others. However, a small incident brings into light their true emotions, and propels Satish to run away. The misunderstandings continue, and pure Savitri becomes a suspected adulteress, an infidel who has sold her love at the altar of lust and greed. While Satish and Savitri are grappling with the sudden storm of betrayal, another woman called Kiranmayi enters the stage. She is the wife of Haran Babu, a beautiful, lusty woman who is about to be widowed. Haran Babu is the friend of Upendra, who is in turn Satish’s best friend. As Upendra is a honest lawyer, Haran Babu makes him his confidante, and expresses a wish to make him the caretaker of all his property. With a noble mind, Upendra and Satish enter the dismal house of Pathuriaghat, where Haran is on his death bed, surrounded by spirited Kiranmoyi and his dejected mother Aghormayi. As soon as Kiran understands that Upendra is the successor of his husband, she becomes virile towards the visitors, who, in her view, want to usurp her rightful due by making a fool out of her dying husband. But, as the story progresses, Kiran realizes her folly and accepts Upendra as her benefactor. But, as she has always been devoid of love, she misunderstands Upin’s general concern for something else and once again, falters in her righteous duty as a good wife. Kiranmayi is the actual embodiment of immorality in this story of ‘Characterless’. She is herself an adulteress, and considers all men to be immoral weaklings who can hardly overlook a beautiful woman. But, when she comes in close contact with her new Brothers-in-law, she gets the shock of her life on discovering the moral strength of Upendra and Satish. Will Kiranmayi be able to mend her ways? Will Satish ever be able to profess his love to deserving Savitri or will he marry the upright Sarojini instead? What would be the future of Upendra’s wife Pashu and immature Divakar? Will they become victims of Kiranmayi’s hunger of love or would they be the key instruments in her salvage? These and many such questions are asked and answered in ‘Charitraheen’, the round about tale of infidelity by Sarat Chandra, exposing the fragility of cherished ideals and despotic authority of human heart. In this novel of love and lust, almost every character is characterless. Be it the strong bodied yet feeble minded Satish, the self effacing Savitri, the honest, sincere Upendra or the Western influenced Sarojini. Each one of them has his/her own notion of love & trust and as the story progresses each one of them leaves his character & ideals and transform into someone else. However, the only salvage is that they at least know they are walking on the wrong path and before the situation becomes irreparable, they do check their actions and thoughts. But, Kiranmayi, Aghormayi and Divakar are a bunch of true amoral, who do not even comprehend their folly, and keep on sliding down the path of sin and at last have to beg for redemption. Though, I have to admit that Sharat Chandra has sketched even the most villainous characters with a rare sympathy. Throughout the novel, Kiran behaves in the most selfish manner and yet she is the most charismatic, mysterious woman ever portrayed in the fictional world. And, all the credit goes to Sharat, who has the uncanny ability to peep into a woman’s heart and express her true feelings. As in Nishkriti and Srikanta, here also he exhibits various facets of woman, dwelling on her emotional weaknesses and moral strength. There is a plethora of protagonists in his novels, and the majority are women. Charitaheen is no different in this aspect. Sabitri, Kamini, Sarojini, Kiranmoyi, Mukta, Aghormoyi, each woman comes into prominence at one or other time, unique with her own web of truth and lies, and Sarat leaves it to readers to interpret their real characters. In the beginning, I stressed upon the aptness of title, as I finished the novel, I realized that the title does not only describe the immorality of characters, but also the fact that at one or other point of time, each one of them loses his peculiar mental aspects, behaving as if he is the soul of someone else. And, thus truly becomes character-less. There can hardly be any discussion about what is right or wrong in Sharat Chandra’s novels. As his characters appear rigid and limited in beginning, but by the time the story is finished, they become much larger, their attitudes broaden and their personalities expanded, goading them to move beyond their comfort zones. I may or may not agree with Sharat’s attitude towards morality, his sarcastic ideologies about Shastras and social sanctions or even the biased praise of other religions, but I have to admire his continuous struggle in finding life’s true meaning, his exploration of faith without being limited to the acceptable social norms and conventions. His novels leave a lasting impression on the mind of reader, forcing him to think beyond boundaries and thus have a long lasting classic appeal. 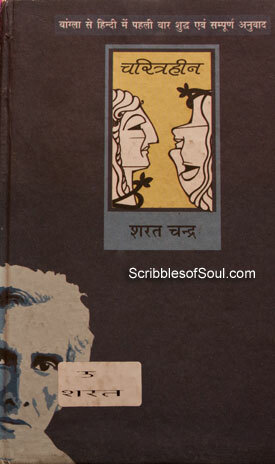 Charitraheen is my sixth novel by Sarat and his commendable story telling has left me desiring for many more. Though I did notice that a few incidents were lifted straight from the plot of Srikanta, especially the meeting of Divakar with Kamini aboard the ship. Further, the illicit relation shared by Kiranmayi and Divakar was again a slightly different version of Abhaya and her Rohini Da. But, as Sarat is known to assimilate his own real life incidents in his stories, I have a strong feeling that these episodes are quite biographic in nature, adding a delectable familiarity to the novel. In short, Charitraheen is superb as a literary gem, a harbinger of change, showcasing an essential transformation in the mentality of man and his society. Reading of Charitraheen novel as wrathful . It shows that this is not a story but the incident happened actually.